At any given time, I keep 5-10 hens at Hawk Hill. Often times they free range during the day, but with dogs and a somewhat urban backyard, they spend many days confined to their 80 year old coop and a 10 foot by 12 foot fenced run. I was frustrated by the fact that chickens will pull up and eat any plant that sprouts in an enclosed run. One year I experimented with rings of fencing to “rest” sections of the run long enough to establish growth, however I found that the chickens had an impressive ability to move the fencing, even when anchored with landscaping pins. 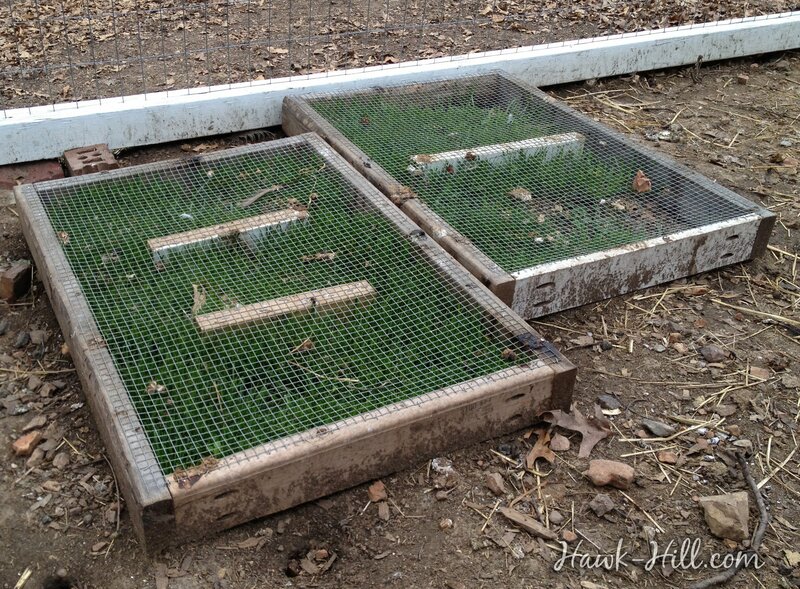 Eventually, I decided to try elevated mesh boxes that would allow grass to grow the top through for the chickens to eat during months when free ranging was more difficult. I decided to experiment with small sections of hardware cloth (wire mesh with openings about 1/4″ x 1/4″ wide) that I had leftover after another project, stapled over a 2×4 frame. The elevated design prevents the chickens from damaging the roots of the grass. 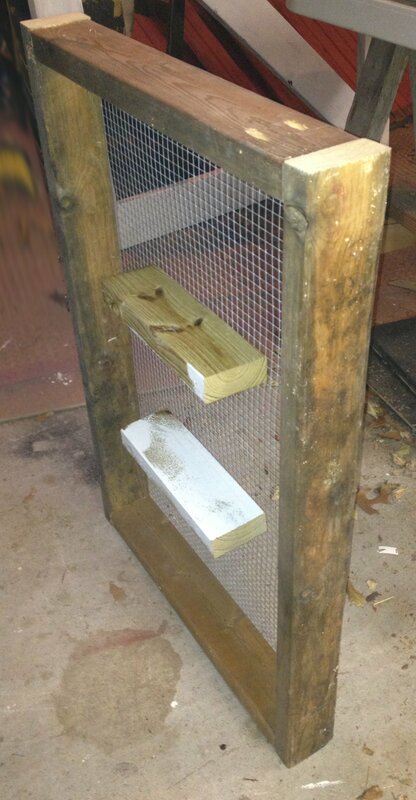 They are simply frames made of 2×4’s, with supports every 12-16 inches to prevent heavy hens from forcing the mesh top to sag and allow beaks to damage the grass underneath. With the hardware cloth firmly stapled to the frames, these frames help provide my chickens with fresh grass for 9-10 months out of the year. 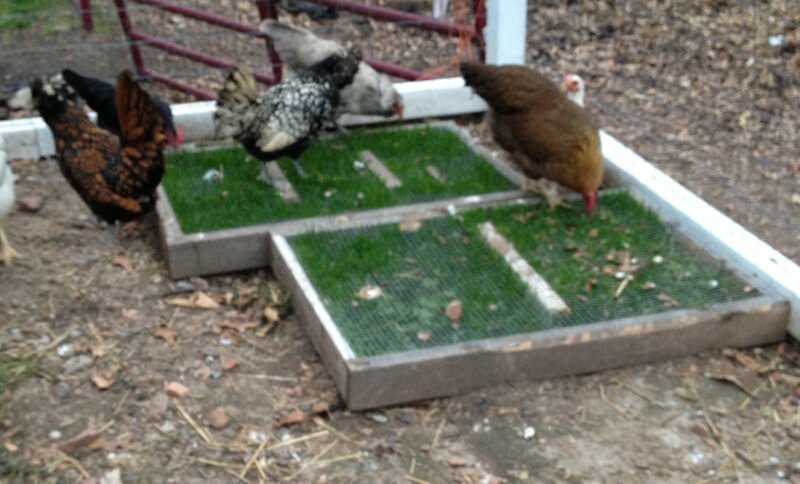 The chickens neatly “mow” the grass, through the mesh, without damaging the roots. 2×4 Lumber (Pressure Treated will last longer) Cut to lengths of 24 inches and 18 inches. Save your scraps for the final step. 1/4″ Opening Hardware Cloth (NO Substitutions, the 1/4″ is perfect but larger openings will expose plant roots to pecking beaks) Luckily, 1/4″ grid hardware cloth is easy to find. Using two long pieces of wood and two short ones, frame a box using whatever method you are comfortable with. I used a Kreg Jig because it makes a very sturdy frame very quickly, but if you don’t work with wood much, basic brackets should work if you aren’t planning on regularly moving your grazing boxes around the chicken run. Using about double the amount of staples you think you should need, staple the hardware cloth onto the wood frame. I advise doubling up on staples because you can expect some sturdy birds to be sitting atop this mesh, sometimes in pairs or groups, putting pressure on the staples. My first attempt at grazing boxes didn’t have supports in the center, and my cleverest hen quickly realized that by plopping down her full bodyweight in the center of the hardware cloth, she could cause it to sag just enough that she could reach the tenderest shoots of young grass. To make sure the grass has a chance to grow strong roots before being pecked, use the scraps of your lumber to create a few points of support. Just place under the grazing box on your workbench and use the staple gun to add sufficient staples to hold the block in place. My experience in Missouri is that whole oats (borrowed from the horses’ feed bins) performed the best. 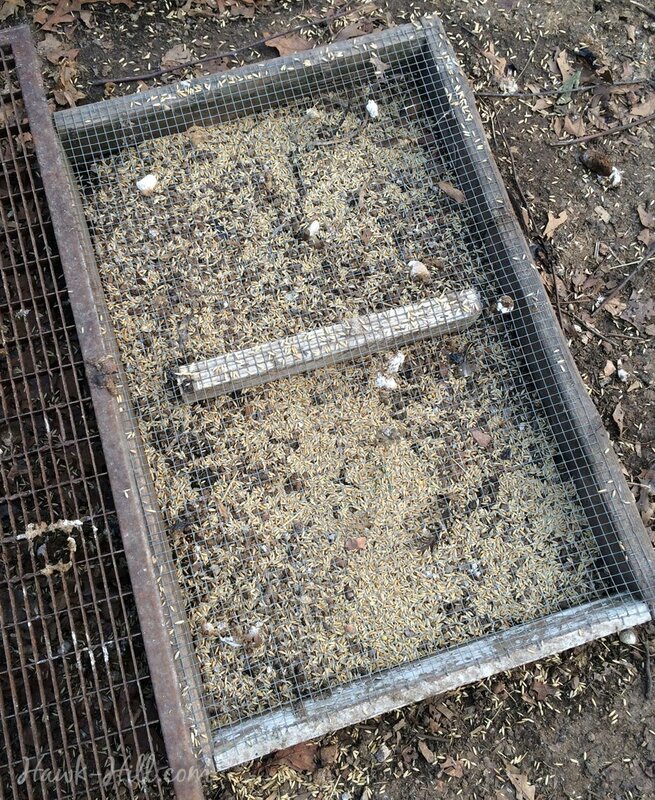 It grows in cool seasons, can be planted without requiring tilling or covering with soil, and has roots strong enough to stay in the ground when chicken beaks pull at the growth reaching through the mesh. Chicken grazing boxes are easy to plant. I usually reseed with whole oats from the horses’ feed bins or with chicken scratch feed. Any whole grain should sprout and you don’t need to worry about unwanted plants going to seed, the chickens will keep the seedlings trimmed back. 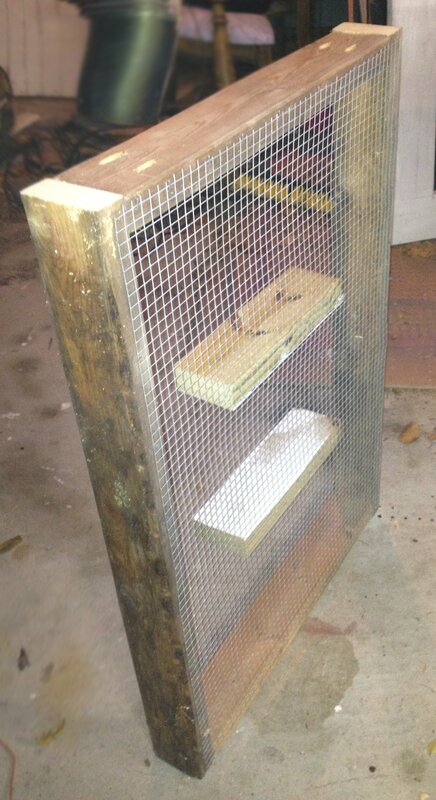 Have you tried anything like this to provide fresh green food to your chickens? I’m considering trying, for a future project, covering the entire coop with a framework of 2×4’s, and sectioning off portions for different type of grasses and portions for dust bathing. We spent the weekend making these out of old pallets for half the floor of our coop. We only have 3 backyard hens in a 5 by 10 run and 5×5 elevated coop. They freerange 95% of the time but in icy, extremely wet or stormy weather I keep them in and their run is awful during and after those times. I can’t wait to see if the oats and greens grow! What a great idea! I’m so excited to hear you build them! I hope you’ll share the results, it’s been great for my girls! My coop is 36′ W x 8′ H in front, 12′ front to back, with the back 36′ W x 6′ H. Built out of free pallets covered in hardware cloth. Leftover hardware cloth on 20′ X 4′ grazing boxes just planted with scratch and short 2′ to 6′ sunflowers. Should be interesting. Lol. All this for 15 birds till I start with chicks sometime. Nice set up! I prefer buying adult hens too, over raising chicks. How often do you water the oats? Great question! I’m pretty hands-off with them, especially since when I’m using the grazing boxes it’s typically the wet season in Missouri. I’d recommend treating them like any grass you’re trying to get to sprout- if it’s hot and dry you’ll probably want to waster them daily. Depending on the weather sometimes I’ll just toss the old water from the chicken waterer in that direction when I am refilling their drinking water.